The college football regular season is winding down, which means it’s time to look at the major conference races. In several conferences, teams in the hunt still have to play each other, which should make for an exciting finish. UCF has survived close calls the last two weeks to remain unbeaten in conference. The Knights are expected to win their final three—home against Rutgers and South Florida; at SMU—but can probably lose one and still win the American. That’s because they already beat Louisville and should they find themselves tied with Cincinnati, UCF would probably win the tiebreaker by virtue of a better BCS ranking. Houston and SMU are not mathematically eliminated, but are eliminated by any other measure. Is FSU Better Than Bama? National Championship Contenders: When Will They Lose? I’ve written about college football polls here before. I don’t like them too much. Now that the first edition of the BCS rankings are out, I decided to vent some more: http://saturdayblitz.com/2013/10/22/bcs-rankings-much-agreement-among-voters/. I also come to Oregon’s and Baylor’s defense (that’s a pun; you will see if you read the article) and share a few other college football tidbits. Enjoy! 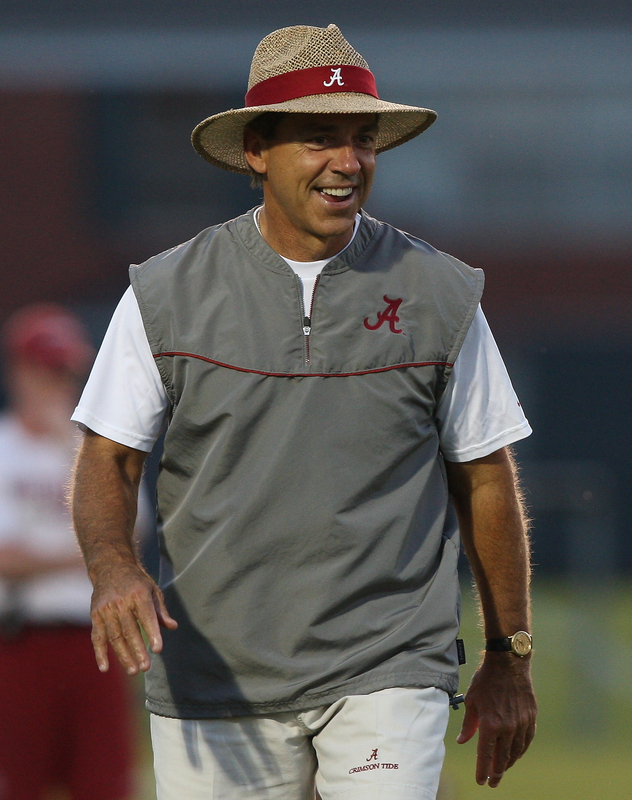 Surely this photo was doctored since Nick Saban never smiles. Nick Saban had just hoisted the crystal football with a look that said, Here it is, humans, now let me start working on acquiring another one. He told a reporter that he would enjoy the victory for an entire 48 hours, twice as long as his usual celebration time limit. Senior linebacker Nico Johnson said the returning players would be angry about the two touchdowns they allowed. My friend Munoz asked me if Alabama was going to start practicing right then and there on the Orange Bowl field. Purdue played well enough this season to get an invitation to a bowl game. Not just any bowl, but a New Year’s Day bowl. Purdue played poorly enough this season to fire its coach. That, my friends, is the modern-day college football bowl system. Purdue is somewhat of an unfair example. The Boilermakers are 6-6, but moved up in the Big Ten’s bowl pecking order because two of the better teams, Ohio State and Penn State, were ineligible. But Purdue is one of 12 6-6 teams going bowling (and not the only bowl team to fire its coach; 7-5 North Carolina State canned Tom O’Brien).